Six popular Korean movies will headline the 2013 Korean Film Festival in the Philippines, which will run from Sept. 18 to Oct. 10 in Manila, Iloilo, Cebu and Davao. “Green Days” is an animated film released in South Korea in 2011 about Yi-Rang, a track runner; Soo-Min, a pretty transfer student from Seoul; and Chul-soo – all oh whom are working towards their dreams. The characters were voiced by stars Park Shin-hye, Song Chang-eui and Oh Yeon-soo. The movie was shown at the 2011 Busan International Film Festival. “Masquerade” is an award-winning film starring Lee Byung-hun of the “G.I. Joe” fame and Han Hyo-joo that was released last year. Lee Byung-hun plays the dual roles of King Gwang-hae and court jester Ha-sun. It won the best film awards at the 2012 Grand Bell Awards and the 2013 Baeksang Arts Awards. “Sunny” is about the story of seven girls whose friendship dates back in high school. Chun-hwa, one of the girls, is terminally ill and asks Na-mi to get together the old members of Sunny for the last time before she dies. The movie’s director, Kang Hyeong-cheol, won as best director at the 2011 Grand Bell Awards and 3rd KOFRA Film Awards. Stars Song Joong-ki and Park Bo-young headline the fantasy-romance movie “A Werewolf Boy,” which premiered at the 2012 Toronto International Film Festival. 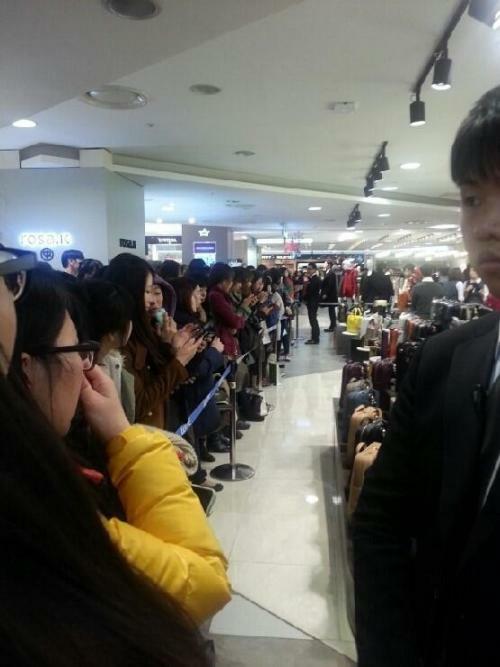 It became the third top-grossing film in Korea in 2012. In “Deranged,” panic grows across the country as an epidemic of suicides occur where the victims jump into the river. The alarmed government declares a state of emergency. Medical supplies salesman Jae-hyuk suspects his family is showing symptoms of the drowning victims and through his brother, detective Jae-pil, they search for the antidote to such. In “Dancing Queen,” the wife of the Seoul mayoral candidate was a Dancing Queen, formerly a popular talent whose chase for her dreams came to an abrupt stop when her husband, Hwang Jung-min, decided to run for office. The movie goes through the journey of Uhm Jung-hwa as she balances her life as a wife of a political candidate and as a leader of the Dancing Queen. According to the Korean Cultural Center in the Philippines, the Korean Film Festival will start at SM Megamall with screenings scheduled from Sept. 26-29, to be followed at SM Iloilo from Sept. 26 to 29, SM Cebu from Oct. 3-6 and SM Lanang in Davao from Oct. 10-13. The 2013 Korean Film Festival will be held in cooperation with the Korean Film Council (KOFIC), the Film Development Council of the Philippines (FDCP), the Korea Tourism Organization-Manila (KTO), Korea Copyright Commission, SM Cinema, SM Cinema Megamall, SM Cinema Lanang and LG. Admissions are free. Surf the NEW WAVE OF KOREAN CINEMA! FREE ADMISSION! Get your tickets at the entrance of the cinemas! 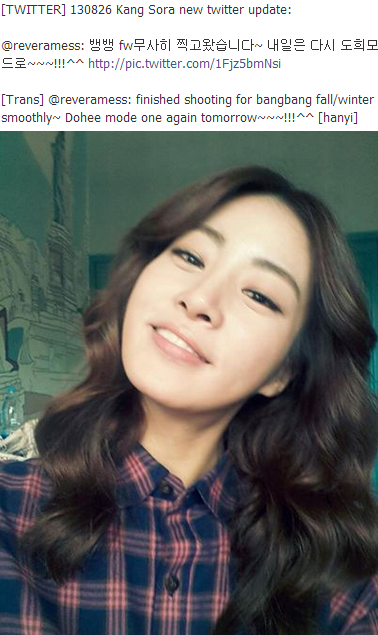 'Ugly Alert' actress Kang Sora has signed an exclusive contract with 'Will Entertainment'. 'Will Entertainment' gave a statement on the 15th Oct, "We had recently signed an exclusive contract with Kang Sora. As much as the burning passion that Kang Sora has for acting, we will provide full support to her so that she can develop her acting career with more stable acting ability and bring out her maximum potential through our organized management as well as domestic and foreign resources." It is said that Kang Sora who was at the same time had received love calls from several agencies, chose to resettle with 'Will Entertainment' after much consideration, noticing the professionalism and profound credibility that the agency's management has and believing that 'Will Entertainment' understands and able to support her acting career the most. Even though Kang Sora signed with a new agency, she will continue to have mutual exchange with her previous agency 'Comapny Dajungdagam'. "To be even more highly professional and intensively supportive, we agreed to establish a strategic partnership with Kang Sora's original agency 'Company Dajungdagam' and therefore will create diverse synergy for the sake of acting career of the actors under both agencies," said a representative of Will Entertainment. Debut in 2009 through movie '4th Period Murder Mystery' and appeared in a few other movies such as 'Sunny' & 'Paparotti', Kang Sora established herself as the leading lady in Korean film industry when she's still in her 20's. Along with her appearance in drama 'Dr. Champ', 'Women Of Our Home', 'Dream High 2'and several others, Kang Sora has built solid acting on both tv and cinema screen. 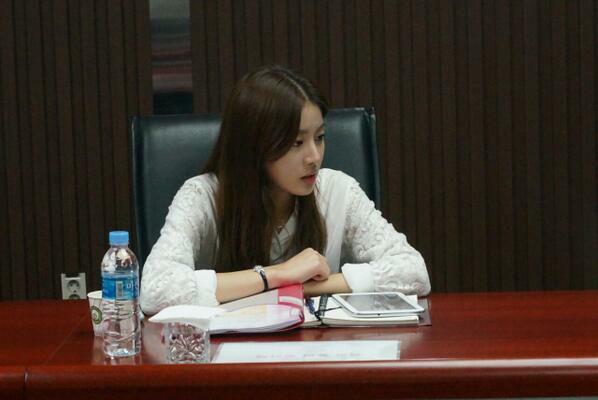 She is currently acting in SBS drama 'Ugly Alert'. 'Will Entertainment'; the company that Kang Sora signed with is a subsidiary company of the music service company 'Soribada' in which actors & actress Lee Bo Young, Lee Ji Ah, Ryu Soo Young, Yoo In Young, Wang Bit Na, Kwon Min Joong and Jin Lee Han are affiliated with. **'Company Dajungdagam' is the one who manages her official website & the one with twitter account>>> @companydjdg who posts her pics when she's filming 'Ugly Alert'. ** I don't know whether 'Company Dajungdagam' is also a subsidiary of 'KM Culture' or not since as far as I know, she was an actress under 'KM Culture'. All articles stated that she was under 'Company Dajungdagam' before joining 'Will Entertainment' and no mention about 'KM Culture' as her former agency. [Drama 'Ugly Alert' and Kang Sora] Until now I have rested for just exactly 3 days. Filming outside throughout the 6 months, I only had 2~3 hours sleep. I also didn't get to do my pilates workout and during my little day off, I would only go for acupressure massage and sleep. [The lesson of daily drama] I have gained some kind of tenacity and endurance. 'I should hang in there', 'I have to survive this', such morale booster words would come out naturally. Even though I receive a lot of compliment for my acting these days, but in my eyes, my acting seems a little bit off/under-performed sometimes. I could tell whether that scene was filmed when I had to shoot for all night long for 3 days and that scene was shot when I had my acupressure massage. To be honest, the condition of my body is pretty obvious. [social issue of interest] I paid taxes with my own hand for the first time this year and in the process, I got interested in political economy. I'm curious what kind of policy was practiced by our constituency and for whom the paid taxes are being used. The part that I got interested with, I'll search for more information about it. I also take a look at CNN News through mobile phone application. [Various aspects of the world that you want to change] Education problem. Given the facts that nowadays, even things like sexual crimes that are likely to be done by adults were committed by elementary school students. I strongly think that humanity education should be taught more thoroughly to the children. [books that you read these days] I read “The Copy Cat” by Miyabe Miyuki & “Snow White Must Die” by Nele Neuhaus. The husband of this German female author; Nele Neuhaus ran a sausage/meat-packing factory. Her book series are all interesting despite the fact that she wrote the books while helping with her husband's work in the factory during her spare time. [Good deed that you practice in life] I don't leave any food on my plate and I hardly use disposable paper cups. [Memory of sharing] I sponsor 4~5 children under World Vision organization. Since I start reading this year, I also become interested in sharing programs. I give aqua watch, sports shoes and other such items as a present under my mother's name. organizations for example, I suggest them to run a theater group. It would be good to make a “situation drama” based on hurtful memories in life through an original play. Sora arrives on the place of photocall. Sora strikes a pose [face on] for the photocall. Sora waves to the audience. Sora is interviewed on the red carpet. 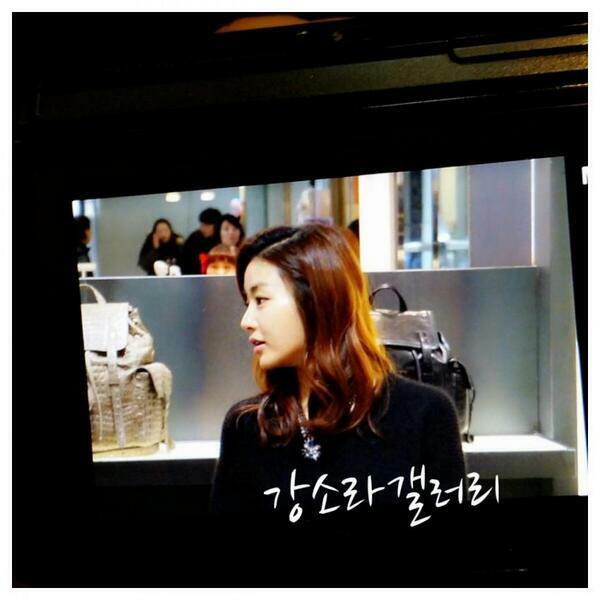 Kang Sora is "Roxie" in "Chicago" ! Thank you Sepia http://blog.naver.com/sepia0814 for the links, the photos and the message. "Before going into the studio where the SBS Drama Awards (2013) are realised, the participants receive many gifts. The lady of cyworld comments : Sora is great and she has a very cool personality." ... maybe because Sora is a ELF (it's the nickname for a fan of Super Junior -Leeteuk was his virtual husband in "We got married"-, the color of Super Junior is the sapphire blue), indeed their album "Blue World" is broadcast this same day ! ( http://sup3rjunior.com/2013/12/03/super-junior-releases-blue-world-short-pv-from-131202/ )Sora arrives on the red carpet. Sora strikes a pose for the photocall. cr as tagged via counut wHer bag is the luxury bag "Helen 2 Premium Monroe" of "L'inouï ". class="entry-title" style="border: 0px; margin: 0px 50px 0px 0px; outline: 0px; padding: 0px; vertical-align: baseline; clear: both; line-height: 1.3;"13 august 2013, Sora posts a message to her fans on DCgall Kang Sora. @companydjdg via twitter on sept 25 said that Sora cannot attend BIFF this year because has to shoot for Ugly Alert. The Company also shares 2 pic from BIFF last year. 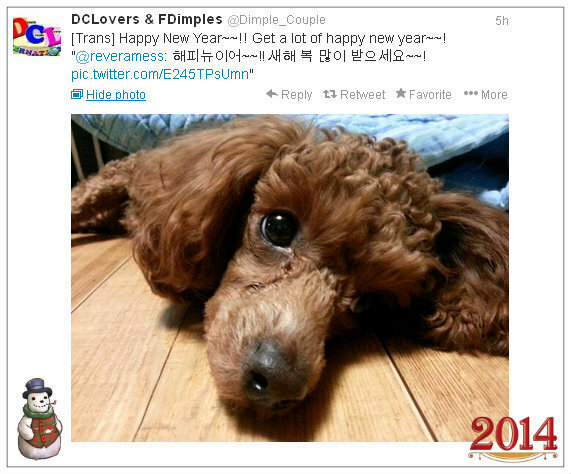 Her dog Gomi is under a sky blue blanket in the post of Sora on her twitter, 1 january 2014. 27 december 2013 Kang Sora visit the actor Ryu Soo Young in the backstage after the performance of the musical "Guys and Dolls". Ryu Soo Young is her sunbae in Will Entertainment. Sora arrives on the red carpet. On her account Twitter (15 december 2013), Sora posted the poster because Shin Eun Kyung acts in this movie. Shin Eun Kyung is Sora's “Sunny” co-star, Sora supports her friend. Thank you "Kang Sora International Fan Club" http://kangsora.wordpress.com for the photos and the videos on Dailymotion of Asia Model Festival Awards 2014 ! Asia Model Festival Awards 2014, Sora wins the popular star award !